It has been another busy month that, at times, has been eventful – life is never dull with horses! In between lots of training and competing, I have also been working hard with lots of snagging and handovers. Firstly we went to Addington Premier League show with both Bodyguard and Felix, who were both superstars. The best results came on the last day with a win in the first ever ‘top hat and tails experience’ for Felix, the Advanced 105 and a personal best score at a Premier League in the Prix St Georges for Bodyguard with a score of 71.54%, placing us third by only 0.2%! We returned home from Addington to a wonderful black filly foal by Bodyguard and out of our DHI Finestra mare by Ferrgamo, born at 7.15am! I went to ride a homebred by Cadans who has been away being broken in and what an amazing prospect for the future she is going to be. Although very sharp and a little scared, her natural movement is fantastic. She will have a summer of Doctor Green (grass) whilst being lightly worked and then I will up her workload over the winter. As quite a late developer she still looks weak and I’m keen to not push her until she’s got the strength to sustain her natural movement without causing any strain on her legs. Jess, Jess (two Jess’s! ), Annabelle and I all headed to Sheepgate Tack and Toggs Championships with Marvin, Midi, Bodyguard, Felix, hoping for lots of red rosettes and a few sashes, and we weren’t disappointed. Felix, although super spooky on the first day which dropped him into second place overall, despite winning the Medium Championships on the second day, he redeemed himself and won the Advanced Medium Championships, so actually had a win on both days. 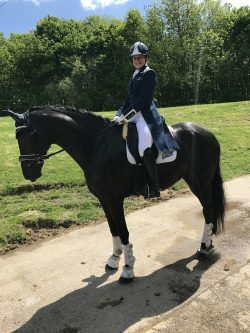 Bodyguard won the Advanced Championship with a win in the Prix St Georges both days and, super excitingly, gained 72.54% on the first day, proving he’s getting more and more confident every time out and I feel like a can now really start to ask for a lot more expression without it upsetting him. I decided to enter Felix into the Prix St Georges just to see whereabouts he is with scores as we are planning his first proper Prix St Georges debut at the end of this year or early next year once he’s a bit stronger. Our head groom, Jess, also came away with a fantastic win in the Elementary Championship on my old eventer, Marvin, who is now 26 but still very much enjoying life. A couple of days later in the field, Felix rolled too close to the fence and got his leg through the metal estate fencing and pulled it out, making a complete mess of his leg. With the fantastic quick thinking from Jess, and vet Norrie from Rase Vets, we got it stitched up and he is now on the road to recovery. Very sadly this will mean six to eight weeks out so the Premier leagues are now out of the question but, to be honest, he’s my horse for the future, so as long as it heals as it should, the future’s more important than this year. After Felix’s injury I was waiting for my luck to turn and it did – with the arrival of two colts by Bodyguard, who we have named Maverick and Magnum! So this year we have very excitingly had Maggie, Mia, Maverick and Magnum, now I just need some help with KWPN passport names beginning with the letter M!